I highlight accessibility problems all the time, like Tuesday & Thursday, so today I’m going to talk about the pleasant surprise I discovered on Monday. I ended up at Manchester & Macklind well before the westbound MetroBus was due, so I headed west. I knew this stretch of Manchester Ave isn’t a trendy neighborhood so I wasn’t sure what to expect as I rolled along passing the time. 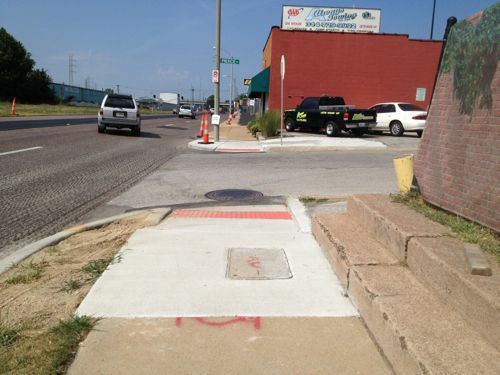 Pleasantly rather than find obstacles at every cross street I found new ADA ramps. Plus they are directional, meaning I could actually continue in a straight path rather than be directed out into Manchester Ave. 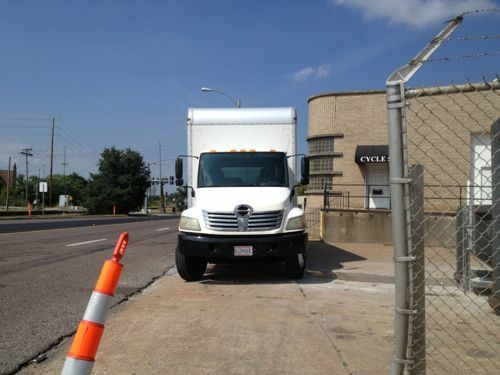 This truck wasn’t even a problem because the driver parked such that I had room to go to the right and behind. Approaching I thought I’d have a problem getting by. I was able to travel 1.1 miles westbound on Manchester before I encountered a problem preventing me from continuing. Not sure who poured the new concrete here, my guess is someone other than the city. So at least 1.1 miles of Manchester Ave from Macklind to Dale (map) is now accessible. 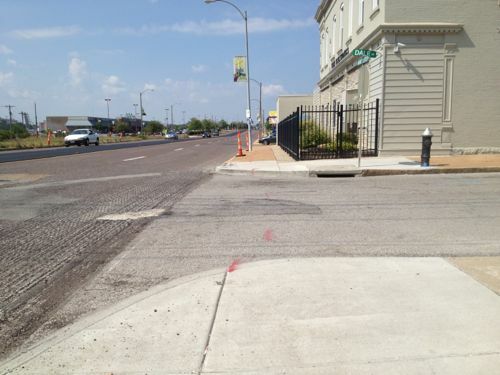 Because MoDOT is resurfacing Manchester they updated the accessibly, as required by federal guidelines. I was prepared to wait for the bus at Macklind, so I was very happy I could spend the wait moving in that direction. The poll last week had two related questions, basically how you’d expand the proposed streetcar through north & south city, respectively. The option that was, at least partially, selected for a north extension of our light rail received the highest number of votes, though hardly a consensus. In that plan the light rail turned north at Goodfellow, whereas I proposed continuing west to UMSL. This would be about a 7 mile extension, perhaps built in 1-3 phases. Natural Bridge is excessively wide so the streetcar could run in a median, just as was planned with the light rail. Nearly the entire route is suitable for densification without displacement. This could bring much needed jobs as well as new housing options. This alignment would replace the current #4 (Natural Bridge) MetroBus route. Current frequencies range from 27 minutes to one hour, depending upon the time of day. UMSL is working on a plan to improve Natural Bridge, better connecting to the UMSL South MetroLink light rail station. A modern streetcar could be a great connection, helping deal with that first/last mile to/from light rail. Spurring new construction, creating construction & permanent jobs. Looking at the votes here it looks like readers would prefer the south alignment to get into the heart of the southside rather than stay closet to Broadway/I-55. If we were to build the planned light rail instead it would go down Jefferson to Broadway and terminate in a park- & ride lot at I-55, with further expansion along the I-55 ROW into South County. 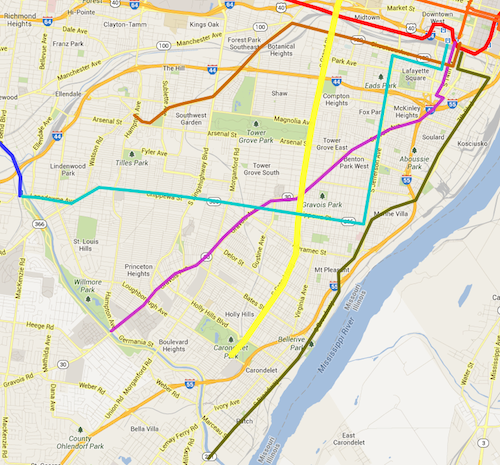 The teal route along Jefferson & Chippewa received the most votes, though the pink route wasn’t far behind. The south streetcar alignment that received the most votes would replace the current #11 (Chippewa) MetroBus which does a big “L” by traveling on Jefferson (north-south) and Chippewa (east-west). This would intersect with many existing bus routes, including the very busy #70 (Grand). Right behind in votes was an alignment that would replace the rest of the #10 (Gravois-Lindell) MetroBus. Part of this bus route would be replaced by the original streetcar route on Olive/Lindell. Going down Gravois would cut through a big section of south city, connecting with east-west & north-south buses. Polls: How Would You Expand Modern Streetcar Lines From Proposed Route Into North & South City? I’m excited about the proposed St. Louis Streetcar, I’m a streetcar fan and the idea of living just a block away from the line has be overjoyed. Like out 20 year old light rail line, the streetcar primarily serves the city’s central corridor — downtown and parts west. 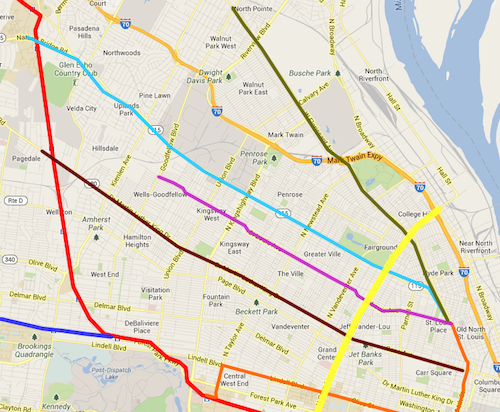 North & south St. Louis wouldn’t benefit with the original route. I’ve lived 16 of my 23 years in St. Louis in north (3) and south (13) city, I know what it’s like to see millions spent on transit infrastructure with little personal benefit. Even living downtown now I use MetroBus way more often than MetroLink, the bus is closer to me and my frequent destinations than light rail. The initial streetcar line will open in 2017, aligned as proposed. The #70 MetroBus line on Grand will get longer articulated buses. Modern streetcars are as much about economic development as transportation. The poll this week is broken into two questions: 1) how would you expand the proposed streetcar line further into north St. Louis from the spur at N. Florissant @ St. Louis Ave. and 2) how would you expand the proposed streetcar into south St. Louis from 14th @ Clark. Some possible future expansions for the proposed streetcar line ending at N. Florissant @ St. Louis Ave. Grand is shown in yellow. West on St. Louis Ave to Goodfellow. This goes through areas also needing the above but runs through primarily residential areas while crossing major commercial streets. N. Florissant to Natural Bridge, eventually out to UMSL south MetroLink. Natural Bridge is a wide right-of-way, plenty of room for a streetcar in the center. Some possible future expansions for the proposed streetcar line south from 14th @ Clark. Grand is shown in yellow. Poll questions for both north & south are in the right sidebar. As you can see these vary and cover different parts of the city. Variations in the street network between north & south city plays a role as well. Please share your ideas for local modern streetcar routes in north & south S. Louis in the comments below. For the last couple of months I’ve posted development opportunities along the proposed St. Louis Streetcar. Like our 20 year-old light rail line, this streetcar would also serve the central corridor. I live in the CC now, and I did when I first moved to St. Louis, but I lived in north or south St. Louis for 16 of my nearly 23 years in St. Louis. I lived in north St. Louis when MetroLink opened in 1993, and south St. Louis when the Shrewsbury extension opened. I rarely used MetroLink during those years, mostly just the occasional trip to/from the airport. 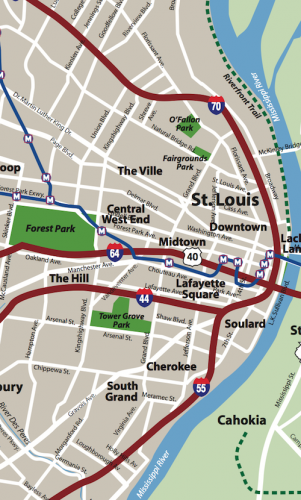 Though I’ll enjoy the modern streetcar line, if it happens, I know it must be expanded beyond the central corridor into north & south St. Louis, within a few years time. Many readers seemed to agree based on the results of the poll last week. Nearly half (48.98%) picked answers involving fixed rail, while 45.3% picked answers running through city neighborhoods. I’m not a fan of running in-street light rail through the city to reach park & ride lots in St. Louis County. The stops would be spaced so far apart it wouldn’t do much to help city residents, unless you happened to live around one of the few stations. Sorry, I don’t view north & south St. Louis as places county residents should have to get through quickly to reach a game downtown. Transit infrastructure should serve the meeds of the neighborhood it runs through. A few years ago a friend suggested we run MetroLink down south of Busch Stadium, through the Soulard neighborhood. Really? You want light rail in a dense old neighborhood? Low-floor light rail vehicles w/platforms would consume much of the 12th Street right-of-way, our current high-floor vehicles would require more room. Side streets would need to be cut off to reduce the number of crossing points. In short, light rail in neighborhoods would be a disaster. Modern streetcars, or decked out BRT (bus rapid transit) is the way to better serve city neighborhoods. 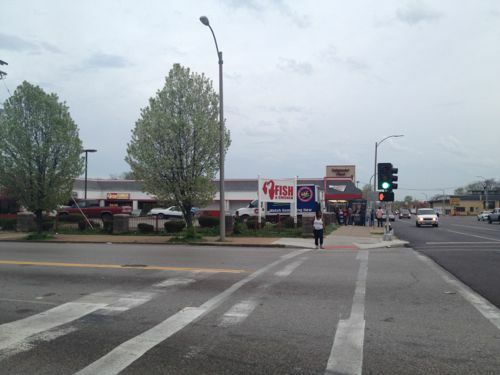 Poll: Best Way To Improve Public Transit In North & South St. Louis? Lately I’ve been posting about the St. Louis Streetcar, a proposed modern streetcar line that’d primarily serve the central corridor from Downtown west to the Central West End. Though the proposed streetcar route includes a spur into North St. Louis, I believe north & south sides of the city have tended to get the short end of the transit infrastructure stick. Our Metrolink light rail opened 20 years ago serving the central part of the city, and the streetcar will double-down on this area. I’ll personally benefit since I live downtown, but I’d like better transit options for reaching destinations in north & south city. I recognize many people might live say in north city but work in south city, or vice versa. 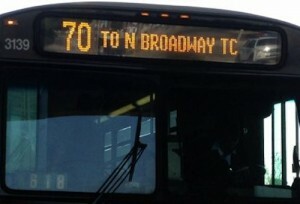 Existing bus routes like the #70 (Grand) only partially fills the transit needs of the city. These answers will be presented in random order in the poll (right sidebar), you can select up to 3 choices. You’ll have the option to provide your own answer as well. A number of years ago East-West Gateway Council of Governments studied light rail lines through North & South St. Louis to reach North & South St. Louis County, respectively, but it went no further. So please vote in the poll, located to the right, and share your thoughts in the comments below. I’ll share my views when I post the poll results on Wednesday July 3rd.